None of us is immune to the positive power of encouragement. I’m not talking about empty praise – I’m talking about true encouragement. Words that give courage through genuine affirmation of repeatable actions and admirable qualities. Or the steadying empowerment of a well-timed and well-meant “you’ve got this!” There’s nothing like encouragement to inspire and energise us; to champion us on to better and greater. Encouragement doesn’t count until it’s spoken. It might sound obvious but just because you’ve thought encouraging things doesn’t mean you’ve encouraged someone. In fact many live in the discomfort of being unsure about themselves, their performance or their contribution because encouragement remains uncommunicated. You have to say it. Write it. Sing it. Post it. Convey it with a high five or a knee squeeze. Don’t hold it in. Okay. Let’s assume you’ve got that part sorted (yeah?) the next step is gossiped encouragement. Gossiped encouragement magnifies personal encouragement. Let’s say Dave does something particularly great. I tell him. I let him know what was so great and how I or others were impacted by the greatness. He’s chuffed. But then I bump into Steve and I say “Steve, you won’t believe how great a job Dave did – let me tell you all about it.” Steve is pleased for Dave. Then Steve catches up with Dave and casually mentions that he’s been talking to me and heard great things about the job Dave did. Dave’s sense of chuffed-ness just went through the roof. Dave realises I must have really meant what I said. I haven’t just said it to his face, I’ve repeated it to others. I get to esteem Dave in the eyes of his mate Steve. And for me personally, I’ve spread a bit of positivity and communicated something of what I value and appreciate too. So there’s two simple steps for us to follow when the opportunity comes to encourage someone. Don’t hold it in. Communicate with content and purpose the encouragement-worthy attributes or actions of others. 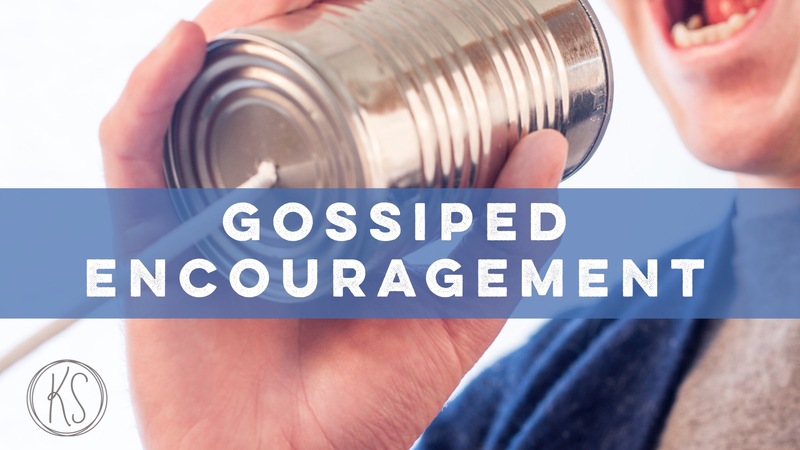 Multiply the power of encouragement by gossiping it to others. Speak to their parents, friends, coworkers, spouse or team-mates. Give others a chance to appreciate their encouragement-worthiness too. Who should you encourage RIGHT NOW?